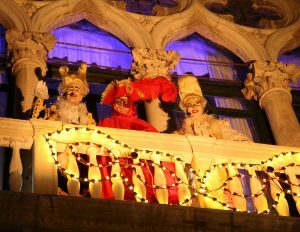 In the magical night of the Carnival of 2017 , candlelight in the most charming Palace of Venice, facing the Grand Canal, among precious scenes and the 18th frescos, you’ll be the welcome guests at the Mask Ball Mascheranda . At the arrival in the Main Saloon richly decorated a mysterious aperitif will be served delighted by surprising artistic performances . 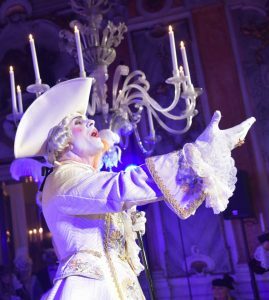 The Masked Guests will then be invited to go upstairs , where , lodged in the Guarana , Longhi and Tiepolo Saloon and in all the others of the Noble-Floor , a grand traditional Gala Dinner will be served , with a live classical music performance . All along the evening , music , fantasy, entertainments , colours and warmth, will be the frame for the magic of the party going on with the Casanova of the Year Election and the School of Historical Dances with the Master of Ceremony , the Boudoir Enchanting the Senses , the Belly Dancers and the great Mask Ball in the Main Saloons with surprises and games based on the theme of the Party. Open Bar available for the guests . Cancellation fees : 50% within the 30th of November 2016 ; 100% from the 1st of December 2016 . Do you need more info about the event? Contact the event organizer: Tragicomica.